According to the F.B.I, the internet is scheduled to be restricted for anyone with Malware on their computer on Monday July 9th, 2012. In order to prevent being affected you must take action to get your computer checked and fixed before then. If your computer is infected and you do have the Malware removed, you will not be able to connect to the internet. 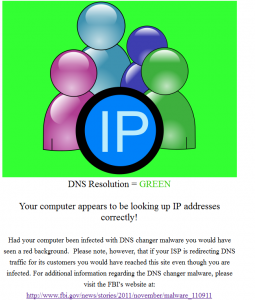 To assist victims affected by the DNSChanger malicious software, the FBI obtained a court order authorizing the Internet Systems Consortium (ISC) to deploy and maintain temporary clean DNS servers. This solution is temporary, providing additional time for victims to clean affected computers and restore their normal DNS settings. The clean DNS servers will be turned off on July 9, 2012, and computers still impacted by DNSChanger may lose Internet connectivity at that time. Malware, short for malicious software is simply “software that is intended to damage or disable computers and computer systems”. It can be introduced to your computer in a number of ways but the easiest is by visiting a website that is infected. This is what happened to many online users in 2007, when a group of cyber criminals created a virus to destroy computers. Nearly a million computers were infected unknown by their users as a result of this online attack. From what I understand, you must run a scan of your computer to determine if your computer is indeed infected. You can run a check at the site dns.okay, dcwg.org or any site you Google. If you have virus protection software installed on your computer, you can use that. I use Norton Internet Security, and I used dns.okay referred to above. It was one click and I received the following message. You don’t want to ignore this issue and run the risk of being without internet. Once a computer is identified as having the Malware virus come Monday, you will not be able to long on to the internet using that computer until the Malware in removed.